Key ingredients: Flour, baking powder, sugar, essence, butter, etc. Wrapping paper may vary from the one shown in the image. Roses are the most commonly use flowers in bouquets. Yellow rose means friendship, and is also considered as a gift to start friendship. 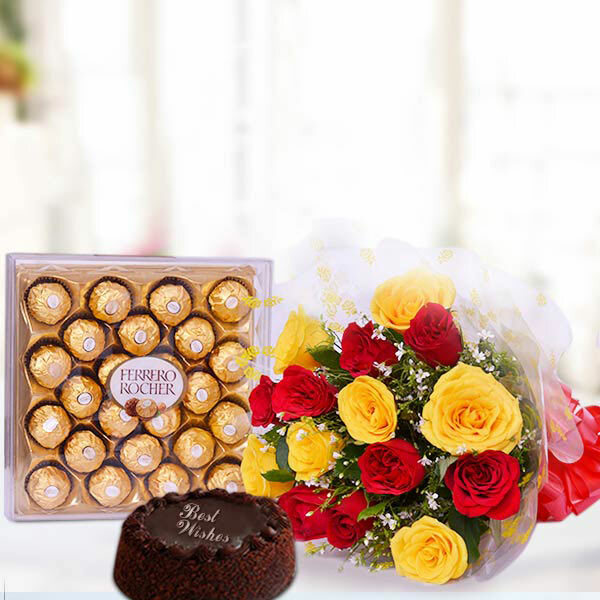 This exclusive hamper comes with fresh 8 Red and 7 Yellow Roses along with 24 pieces of Ferrero Rocher Chocolate box of 300 gm. Deal doesn’t end here. 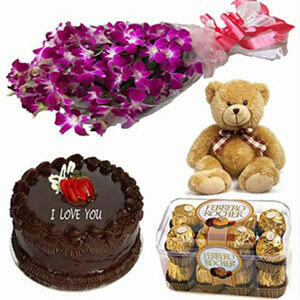 This combo also has a yummy chocolate cake of 500 gm. 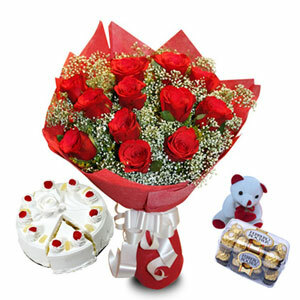 Roses in the bouquet are looking really fresh and the chocolate cake is also very tasty. Go for it guys it looks amazing.